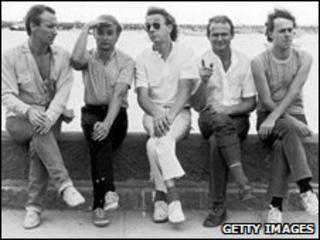 A judge has ordered Men At Work to hand over royalties from the 1983 hit single Down Under after earlier ruling they had plagiarised a children's song. The Australian band must pay 5% of money earned from the song since 2002 as well as future royalties. Larrikin Music, which owns the copyright to Kookaburra Sits in the Old Gum Tree, had sought 60% of royalties. The company argued successfully that Down Under's flute riff was stolen from Marion Sinclair's original song. Sinclair, an Australian teacher, wrote Kookaburra Sits In The Old Gum Tree more than 70 years ago. It has since been sung by generations of Australian school children. Larrikin Music, which is owned by London's Music Sales Group, bought the rights to the classic folk song in 1990, following Sinclair's death in 1988. "I consider the figures put forward by Larrikin to be excessive, overreaching and unrealistic," Federal Court Justice Peter Jacobson said in his ruling. The court did not specify what 5% of the royalties would represent in Australian dollars. Down Under - the story of an Australian backpacker touring the world - reached number one in Australia, the US and the UK, and remains a popular favourite at national events. Colin Hay, who co-wrote the song with fellow bandmate Ron Strykert, has said any reference to Sinclair's folk song was "inadvertent, naive, unconscious".